Just a bit of a warning. We mostly keep these upbeat and positive, and while the message below is fairly positive, it’s also a bit of kick in the pants too. And we all need some good ol tough love every now and again, to get up and actually make a change we need in our life. This past week our teammates took to the web sharing their sweaty selfies, after taking a VFit class and we asked them to share their favorite inspirational quotes with the pictures of their hard work and sweat. We do this for a few reasons. We view sweat as a badge of honor! Sweat is a beautiful thing for our bodies! It shows we challenged ourselves, got more oxygen through our body, boosted our endorphins, and detoxed our bodies. At times, posting a sweaty selfie can really be a challenge for members to step out their comfort zones. But what we focus on, is the pride in taking that time for self care and putting a priority on your wellness. We focus on sharing the message of self care with those that we love and hold dear to us. We also push members to continually reach beyond their comfort zones and expand them. Not just in classes, but in real life! And so when Kathy from team Eastern Sierra posted this quote and picture, we knew it HAD to be our inspo for the week. Kathy has always worked out hard, and just so happens to be very good friends with owner Rachele. 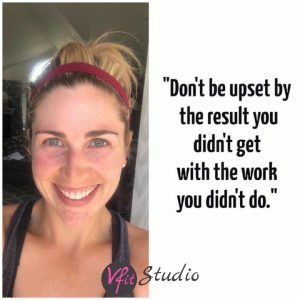 Yet, as we shared in her member story a few weeks ago, it took her much time to finally say yes and check out VFit. Now you’ll see her name toward the top of the leaderboard each month! So here we come to this weeks inspo! May it fire you up as much as it did when I read it. We could probably stop the blog here. Enough said! This is powerful stuff, and so true. But we will go on and share why this quote meant so much to us and why we hope it is just the inspo you need this week to SHOW UP and work toward your goals. You cannot wish yourself to health. You just can’t. You also can’t just go gung ho for a week or 2 and then give up time and time again because what you wanted didn’t happen fast enough. If you are sitting here reading this email and are having issues walking up and down the stairs every day without getting winded, but do nothing anything about it, guess what? Nothing about your situation is going to change, unless you start putting in the time and increasing your level of wellness to where you are able to do it with ease, and then some! You cannot look longingly at pictures on Facebook of your old high school bestie, who hikes through the mountains and adventures around the world doing incredible things, and wish you could get out on epic hikes, but then sit there each week doing nothing to better your stamina, strength or confidence. This winter was dark, cold and down right brutal for so many. It was an easy excuse to throw your self care out the window. But if you know us, we don’t like taking the easy route in life and letting every excuse keep us from greatness. Did you set big goals for yourself on January 1st, wishing for a strong and healthy body come summer, but when you peel back that cozy winter jacket, baggy sweaters, and uggs, you are facing a body you neglected and kept telling “next week, I’ll get back to it”. And here you are now, in the middle of April, with summer knocking on the door, and you are no where close to the goals you wished for in January. See, a goal without an action plan and without action, is just a wish. And wishes don’t do anything to change and better you. You have to be consistent. Create a plan. And take ACTION to work towards building that strength, stamina and health in your body. You need to show up consistently to train your brain that YES you can overcome excuses and still show up. Your path to success may look very different than others, and our goals vary from person to person, but the number one characteristic of people who achieve greatness in their life, are people who take action! What is needed to get results in any area of life is ACTION and WORK. Yes, we make fitness fun at VFit. But it’s also work! It’s called working out for a reason. You come to work and better yourself. It’s an amazing opportunity you get to face each and every class you log into. // adaptability – we go wherever you are as long as you can live stream classes, we are right there with you. Or if you can’t stream a live class, our on demand library is there for you 24/7 for you to take any format you wish! If you have not found something that hits all the above marks in your life, today may finally be THE DAY where you start putting in the work, by creating your plan, and taking some ACTON, with our team.